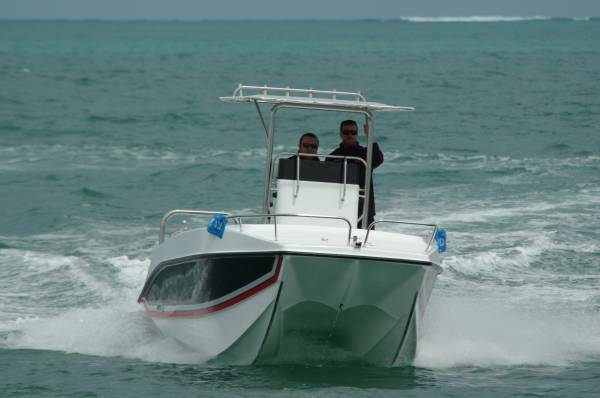 The Explorer Sea Cat 565 Centre Console is an off the beach power cat from South Africa’s east coast. Which means it is tough because they literally launch off the ocean beach there, straight into surf, and their return can be virtually a dumping. Stainless strip protectors for the keels give a clue. 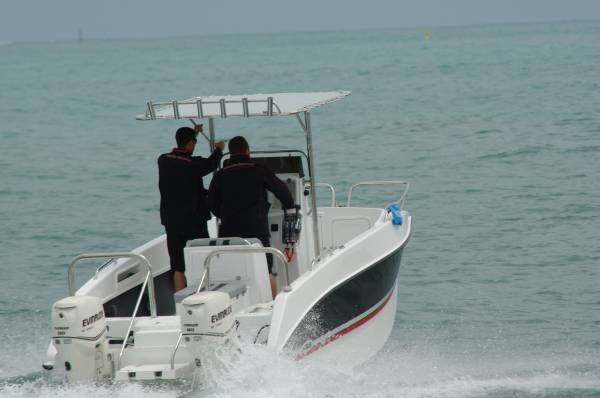 5.6m long with a 2.3m beam is not a big boat, but the Sea Cat has the typically spacious feel of catamarans. And the stability too; three weighty men made little impression on it – I have stood on shakier jetties. The builders made the most of the space by clever seating: the driver gets a bolster rather than a seat, and immediately behind it a box seat runs fore and aft rather than across the beam. This both makes it roomier and allows plenty of space at its sides for fishing. Like all centre consoles and most cats, the Sea Cat is first and last a fishing boat. Stability and space tick the boxes and so does the fit out. There are rod racks within the bulwarks; a self-filling bait tank with a clear panel lives in the transom; behind a door right forward is a stack of tackle drawers. It looks as though there are four catch tanks under the self draining deck but there are only two; the other lids cover compartments to house portable tanks. If you can carry enough fuel in them portable tanks have many plusses, ease of draining and cleaning and so an end to condensation and stale fuel worries being a couple of the big ones. If two fuel tanks are not enough, the catch tanks will take another four. General storage is well provided for. Between them a pair of lockers in each of bow and stern, the console, the side pockets, the seat box, and a locker in the bolster’s back house far more gear than three or four anglers should take to sea. Where the console’s dash panel would normally be is, instead, a locker with acrylic doors. The idea is to provide a splash-proof home for permanent or demountable electronics – with enough room left over for mobile phones and the like. As usual I looked around for hand holds before we reached throttle to the stops country at the boat harbor mouth. Again the surf beach ancestry showed itself: they were everywhere. A couple of powerful rails aft were not for protection of humans though: these were the crash guards for the motors should we roll in the surf! 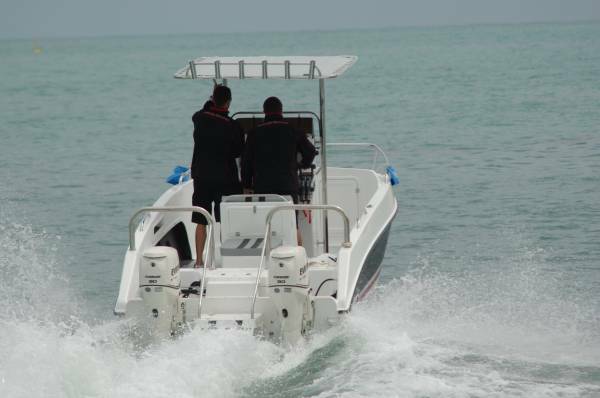 The motors were a pair of 90hp Evinrude ETECs, at the special order of the buyer, although the standard motors for this boat are twin 60s giving a $10,000 saving. It quickly became clear that 60s would do a fine job – the 90s gave explosive performance. Launch onto the plane was practically instantaneous and acceleration to the high 30s of knots barely less so. This suggests an efficient hull, many cats being hungrier for power. We had a medium to heavy swell left over from a powerful northwester, overlaid with a significant wind chop; a test for any boat under six or so metres. The Sea Cat came up trumps. It moved around vigorously enough, but that was inevitable with its size and the sea conditions. What mattered was that it did not complain about it, and when it landed from the lifts the sea gave it neither did our backs or knees. Response to the wheel felt crisp, and it leant slightly into the turns which is a lot more comforting than the outward, destroyer-type lean of many older cats. With a price from under $60,000 this is easy on the pocket for an 18ft cat. 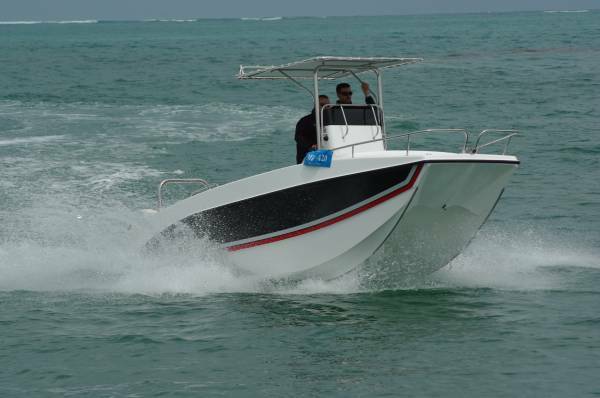 It is also a tough and highly competent fishing boat.